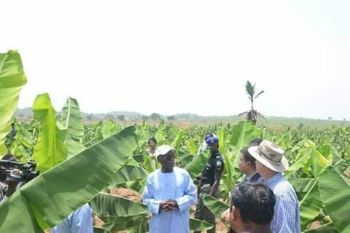 The Honourable Minister of Agriculture and Rural Development, Chief Audu Ogbeh was on a working visit to the first organic banana plantation cultivated on a 250 hectares farm in Kwali Area Council of the Federal Capital Territory, Abuja. The farm which is purely organically cultivated without the use of any chemical fertiliser is a private agribusiness investment by Indian owned Contec Global Agro Company, a project aimed at creating employment and boosting the country's agro-export potential. 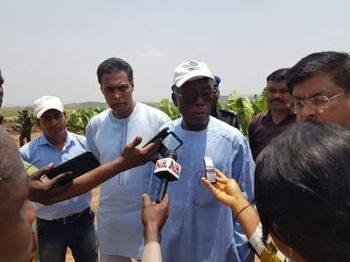 Speaking during the inspection of the plantation, Chief Ogbeh said the plantation project is part of hand-walking private sector investors into the agriculture sector in line with Nigeria's Agricultural Promotion Policy, also known as ‘The Green Alternative'. He assured that the government would continue to provide enabling environment for agricultural investments to thrive in Nigeria. The minister expressed happiness that the project which is first of its kind, would employ young Nigerians and help meet both local and export demands for bananas. 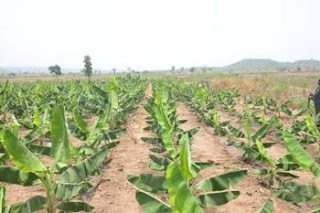 Commending the owners of the organic banana farm, he said that the Federal Government would continue to support both local and foreign investments in the agriculture sector. “We are happy that in spite of the difficulties people face, they still remain and invest. This is the message from Mr President, stay close to the investors, and give them all the support they need. If there are things you can't handle yourself, come and tell me about them and I will do that," he said. Managing Director, Contec Global Agro, Mr. Thomas Chackunkal, said the 250 hectare banana plantation is a biologically safe demonstration farm which is part of the company's organic farm products and bio-planting projects to help Africa develop its agricultural industry and ensure food security for the future. He added that the banana plantation would be replicated in Osun, Akwa |bom, Cross River, Taraba, Edo and Oyo states. Addressing newsmen shortly after the inspection, Chief Ogbeh expressed concern over the increasing numbers of liver and kidney diseases among young people and explained that the objective of going organic in food production is to eliminate dangerous elements from foods. "To ensure food safety, the place to begin is the farm, right from where you are planting, from the soil, from the biochemicals, the water, all of that has to be controlled and then you have healthy foods," the minister said.